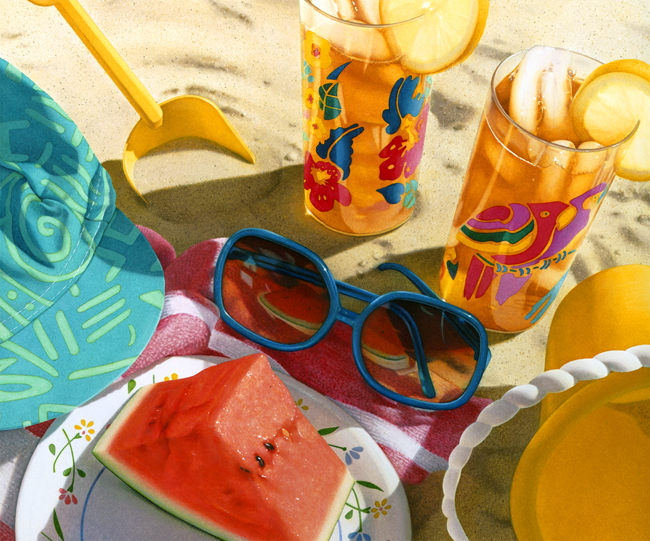 I created this painting many years ago, and it reminds me of summer. I have great air conditioning where I’m living now, which is something I’m thankful for! 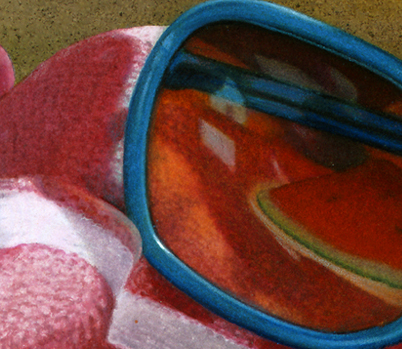 This is a close up to show the melon reflecting in the sunglasses. I am still cutting watermelon for my youngest son, who is 16. But the reference photo for this painting was taken in my children’s old sandbox and those days are over! I am very excited to share that I have written my first new song in four months. I’m not even certain what I will name my song, but the lyrics are profound and speak to me in many beautiful ways. Accepting that my past has made me who I am today, allows me to live without regrets and bitterness. That wasn’t truly honest. I am human and want my song lyrics to reflect the fact that there were times I wrestled with unhappiness about some of the difficult circumstances I have faced in my life. No doubt there were sometimes traces of bitterness, especially with the death of my first child. I prefer my revised lyric line because refusing to succumb acknowledges the struggle and thankfully, I have prevailed! 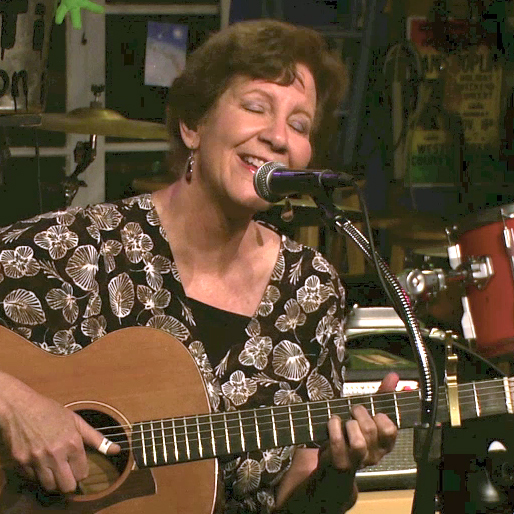 Like many of my songs, the theme is about love and memories. There are many dual meanings in my song. Although it appears to speak to those grieving, it is a clear message to me about the power of self-love. I also am trying to maintain optimism that I might one day experience romantic love again in my life. My post title was taken from the first line of my song. I accept that the many things that were difficult in my life allowed me to grow and reach a place of healing and joy. But my post title is also applicable to other things for me. For instance, I have worked on my singing and vocal editing for endless hours. As a result, I improved phenomenally and many of the songs I edited six months ago I am redoing. I look at my improvement as a learning process; nothing was ever a waste of time because it led me to where I am today. The place where I now reside is a beautiful one. I love my life because I am following my dream. Below, I bravely share an acoustic rendition of my new song, which I’m not sure of the final name yet. Clicking the blue link plays audio. Yesterday, I had lunch with my good friend, Carol. It is a result of my blog that Carol and I reconnected again. My old boyfriend, Sam, found my blog and he gave me information to find Carol. They had formerly been engaged. He knew where she worked after seeing her at a high school reunion. Sam is a well-known physician and a good friend. He is happily married, and I have many exchanges with him on my blog. I am fortunate to have his friendship. 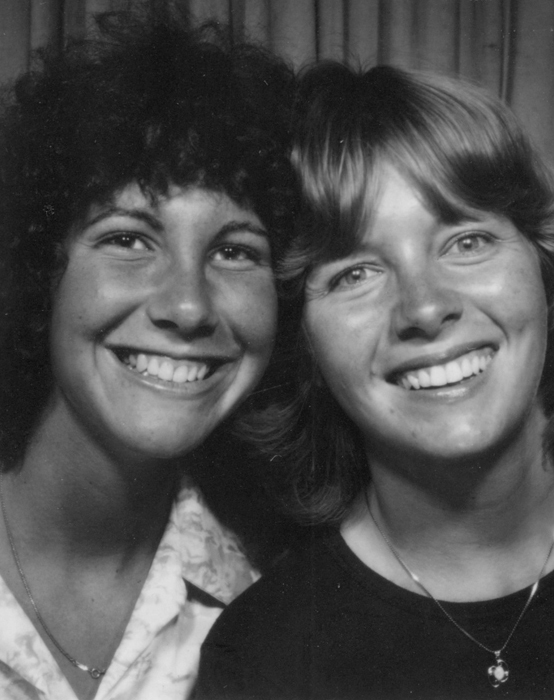 While having lunch with Carol yesterday, I found it amazing that even though we weren’t in touch for over thirty years, it felt as if our time apart was brief. I mentioned to Carol that it might be fun to get a pedicure before our lunch. She was open to it and told me she had never had one. For most of my life, I never had either – but when my journey began three years ago, I started to do new things. I was a little concerned because Carol let out a shriek when the pedicurist dug under one of her nails too deeply. But she quickly recovered and after that the woman was more careful. 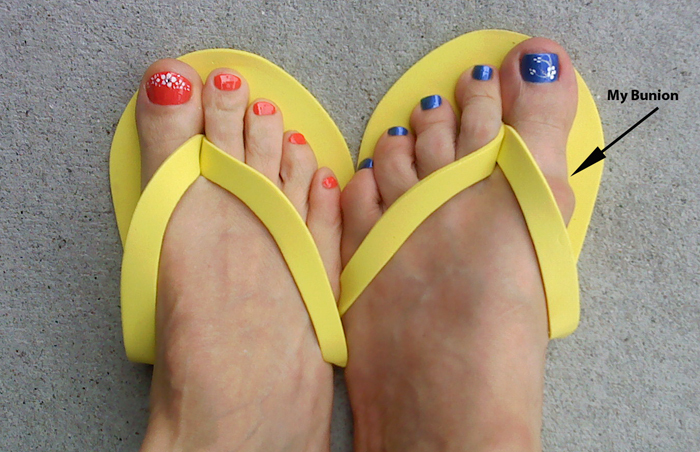 I hope Carol likes her flowery toenails. I share our cute feet. I pointed out my bunion on the right because I used to feel my feet were ugly, but not anymore! 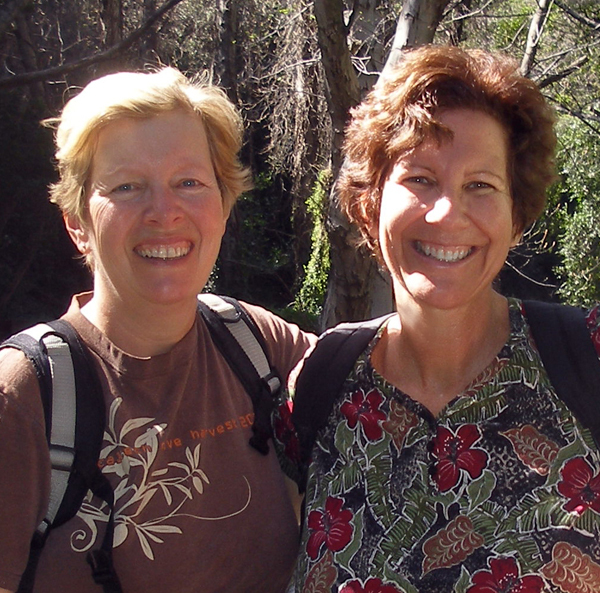 Below are some pictures of Carol and I in our twenties and one of us hiking two years ago in our fifties. 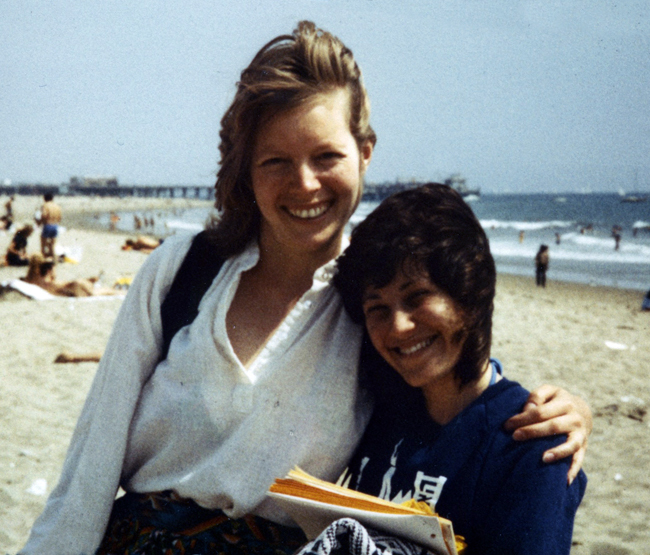 In this picture, my close friend Cheryl is on Carol’s right. Cheryl died from breast cancer five years ago. The nurse on the other line was doing her job. 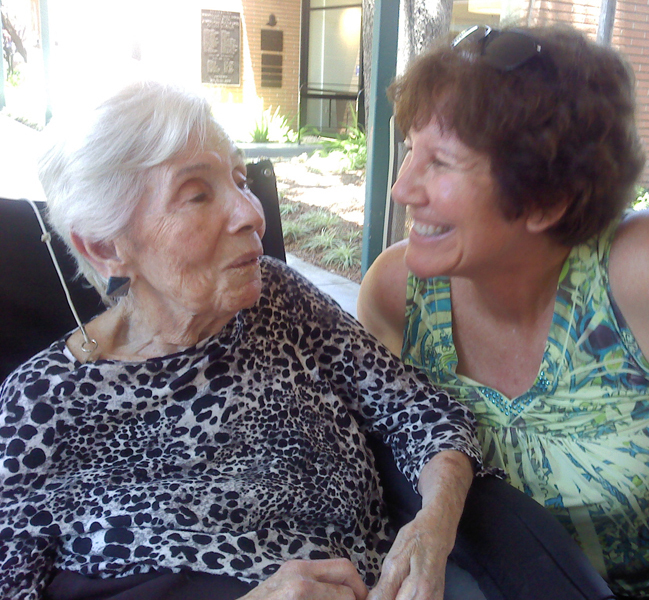 She was calling from my mother’s nursing home and those phone calls were usually bad news. Every bruise or skin tear needed to be reported to me; they happened easily and frequently. My heart skipped a beat as I waited to hear why she was calling. She informed me that my mother had gained four pounds in one week. I was astounded. My mother had been steadily losing weight. What a wonderful turn around! I was elated and smiling. At that moment, my eyebrows went up so high that they hit my scalp. Before I could say anything, the nurse quickly hung up. I shook my head and laughed out loud at the irony of this whole exchange. Recently, as thin as my mother had become – we continued to take pictures with her and revel in the fact that she could be taken out to restaurants. It is truly a miracle that my mother is still alive with all that she has gone through. In 2009, She survived being on a respirator for two months. For almost a year after that, she had a feeding tube. But things are different now that she has severe dementia. I made a mental note. I anticipated that if this continued, the nursing home might ask me if I would allow her to have a feeding tube inserted. For certain, I would not allow it. This is another example of how everything that I have gone through, led me to this place. I am not looking to extend her life and risk her suffering. At this moment, I am so very thankful that my mother is not in pain. 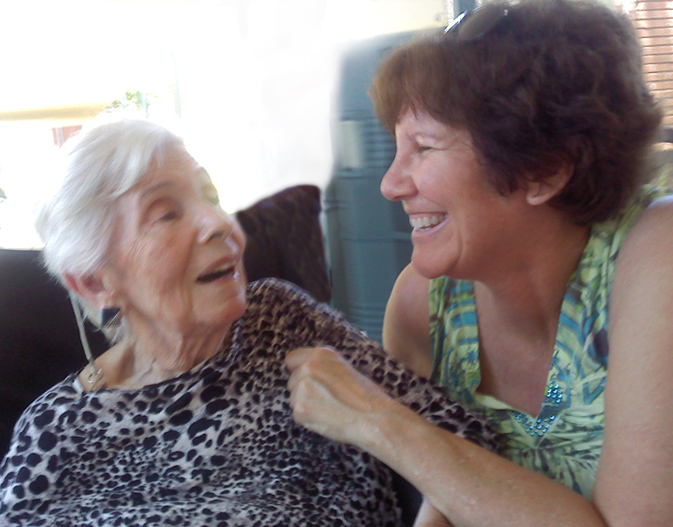 My greatest appreciation is that even with her dementia, she is aware of who I am and deeply loves me. Aside from her brief smiling moments with me, the rest of the time she mostly sleeps. She may not be able to find words anymore. She may not be able to remember how to chew and swallow. But her face lights up when she sees me. Love is clearly something that she holds onto. And that is something that I am also inspired to do, despite the heartbreak and loss I have experienced in my life. 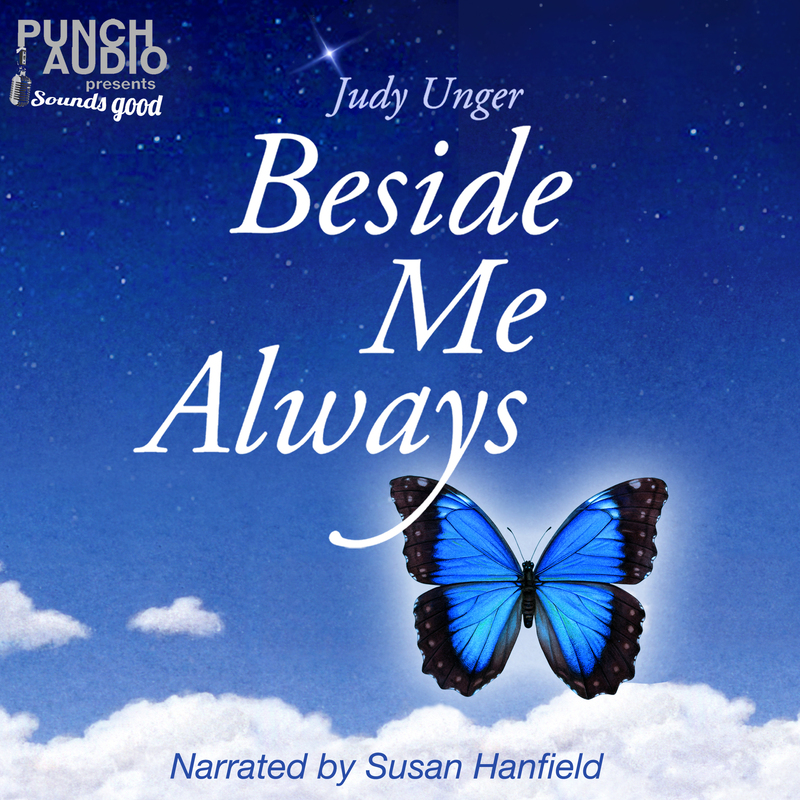 © 2013 by Judy Unger http://www.myjourneysinsight.com. Unauthorized use and/or duplication of this material without express and written permission from this blog’s author and/or owner is strictly prohibited. Excerpts and links may be used, provided that full and clear credit is given to Judy Unger with appropriate and specific direction to the original content. This entry was posted in Uncategorized and tagged "sandwich generation", acoustic guitar, Advocacy, Aging Parents, Caregiving, childhood friendship, composing, creativity, dementia, following a dream, Friendship, grief, GRIEF RELATED, guitar, healing music, Humor, humor daily life, inspiration, loss, lovesong, lyric development, lyric writing, lyrics, mother, mother daughter relationship, mother's illness, Music, original songs, singing, songwriting. Bookmark the permalink. So few people get that simple fact of how we are here at this moment due to all our experiences good or bad. I have always believed we are exactly where we are supposed to be at any given moment. In the past when asked if I had regrets I gave the answer that was expected. With my husband I risked saying out loud that I do not have regrets. If I had done anything different in the past I would not be here right now. Here is a pretty good place. Even when I do not have the strength to speak I am happy to see those I love and just hear them talk and tell me about what is happening in their world. I am so relieved for you and your mother that you do not want to extend her suffering. Thankfully, she is not in pain now and my hopes and wishes are she will have a peaceful end. You are a brave woman on a path that is going to and has given you great challenge. You are just the woman for the job.